Virgogray is proud to present a new publication of poetry by poet, Peter Marti. 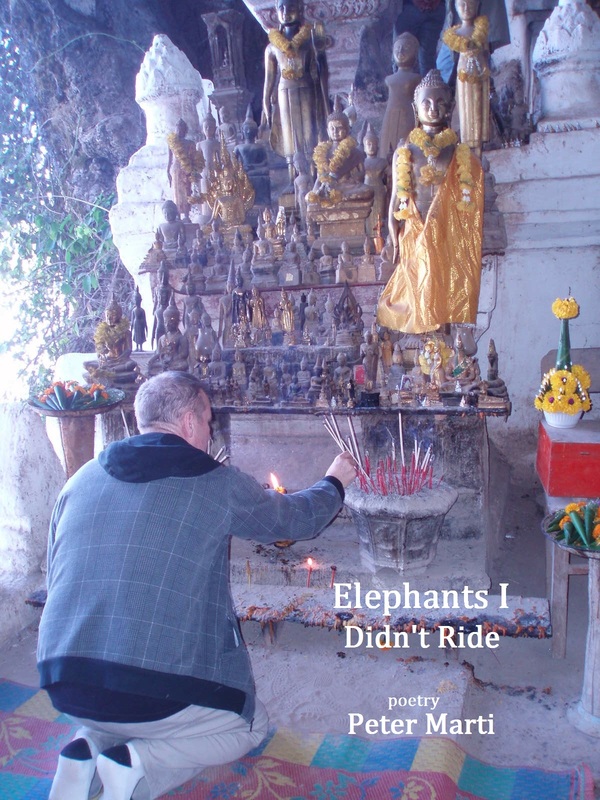 Elephants I Didn’t Ride is an exciting collection of photography and verse, that takes readers on a trip to the far East and the lands of Hong Kong, Thailand and Laos. Marti provides poetic snapshots of his journey, a nod to the art of “sketch”style poetry. Elephant’s I Didn’t Ride is almost a poetic diary describing the poet’s encounters all along the way with crisp and sometimes laughable experiences in the unknown. Peter Marti is a veteran of the California post-beat and neo-beat scenes and has had his work published in a variety of mentionable venues, including City Lights Journal and the Beatitude Golden Anniversary issue. Marti also studied at Naropa University and has read alongside poets like Dianne Di Prima and Allen Ginsberg. To share this collection with a hard working and recognized poet as Peter Marti is indeed privelege, and we are sure readers everywhere will be excited by this latest literary work to be added to the underground and independent body. 58 pages. B/W photographs by Bernard Ries.